We had the opportunity to facilitate a review for a Head Lamp from Devine LED. As summer approaches I've been thinking about our camping plans. We love to go camping, although this year I am a bit anxious about it. The baby will be about 6 months old. I have been thinking about being preparation. If I am going camping with the baby, I'd like to be overly prepared for a fun, stress-free, safe time camping with a baby. Lights are a necessity when camping. 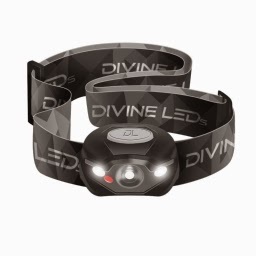 We received the HeadLamp from Devine LED for review, and I thought this would be perfect for our camping trip. A hands-free headlamp for changing and feeding the baby, time in the tent and bathroom trips. The XE Series Headlamp offers a lightweight headlamp with adjustable elastic strap for a snug and customized fit every time. The headlamp has multiple modes Strobe light, Red Beam, Single Beam, Dual Beam and a Dimmers allow you to adjust the light strength to suit the task at hand. Your task can be accomplished hands free. The headlamp is made from military grade materials. It is guaranteed to work as hard as you do. This versatile headlamp is an excellent replacement for that old bulky flashlight. The Headlamp requires three AAA batteries that are not included. They are easy enough to put into the battery compartment. The headlamp is also water resistant. Not only are the LED headlamps perfect for camping they are also great for biking, running and walking after dark. This would be great to have during a power outage, no more carrying candles around. The lighting options work well in different situations, a bright light for walking down a dark road or a dimmer light for when you are reading a book in bed. Devine LED makes many kinds of lights from bike lights to flameless candles. They offer a lifetime warranty. For the affordable price these headlamps are over at Amazon I am thinking all our bulky flashlights need to be replaced.